The Bellegarde Peach tree has a deep red skin striped with dark purple. The flesh is pale yellow and firm turning slightly red towards the stone. Apparently the Bellegarde started off in France so if you notice your Peach tree protesting at truckers at the local sea port, moving in the opposite direction from a conflict and criticising English food, then you will know why. 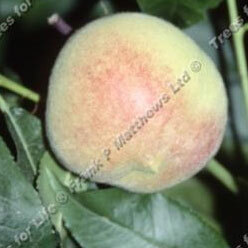 Our Bellegarde Peach tree is self-fertile and so there is no need for a pollination partner nearby to produce fruit.